Today we travel on, over and under the Detroit River. Before the twentieth century, one could only travel on the river. The first vessel recorded on the Detroit River was a ship called the œGriffin.” She was built at the mouth of Cayuga Creek near Niagara in the year 1679. During her maiden voyage, the Griffin entered a small unnamed lake after passing through the mouth of the Detroit River. Since this occurred on the eve of the festival of Ste Claire (held in honour of the founder of the Franciscan nuns), the lake was named St Clair. On her return trip from Washington Island, in Lake Michigan, the ship ran into a bad storm and sank. 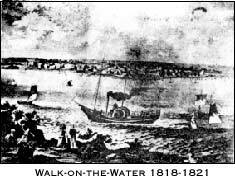 The first steamer on Lake Erie was the œWalk-in-the-water.” She was named after a Wyandotte Indian chief and sailed from Buffalo to Detroit arriving August 17, 1818. She could make this run in 44 hours. On October 31, 1821 she was wrecked in Lake Erie. The first Canadian steamer was the Western, built in Chatham by Duncan McGregor in 1830. This ship ran between Amherstburg and Chatham. In 1825 regular ferry service began at the foot of Brock Street in Sandwich. The œGem” ran between Windsor and Detroit and between Sandwich and Springwells, Michigan. Mastered by Captain James Innes, a Scotchman born in Chatham, Ontario in 1844, who captained several ships on the rivers and Great Lakes for more than 50 years. Afterward, the steamers Argo, Gem, Essex, Detroit, General Grant among others, ran on the Detroit River. The favorite ferry landing in those days was in Windsor where the stone CPR station once stood. (across from the CBC on Riverside Drive West near Crawford: see œGone and Almost Forgotten, Walkerville Times, Sept. 2000). Captain John. D. Sullivan, born August 14, 1825, was the master of the Grand Trunk Railway car carrier œLandsdowne” (see œFeedback”, The Walkerville Times, Summer 2001). This train ferry ran from Detroit to Windsor for many years.